Safavieh Mid-Century 24.6-inch Madison Ave White Counter Stool (Set of 2) - 18.7" x 19.7" x 34.2"
Safavieh Mid-Century 26-inch Garretson White Counter Stool (Set of 2) - 22.6" x 17.4" x 36.2"
With a simple and elegant design, this set of Safavieh Madison Ave counter stools is a versatile addition to your kitchen, bar or patio. 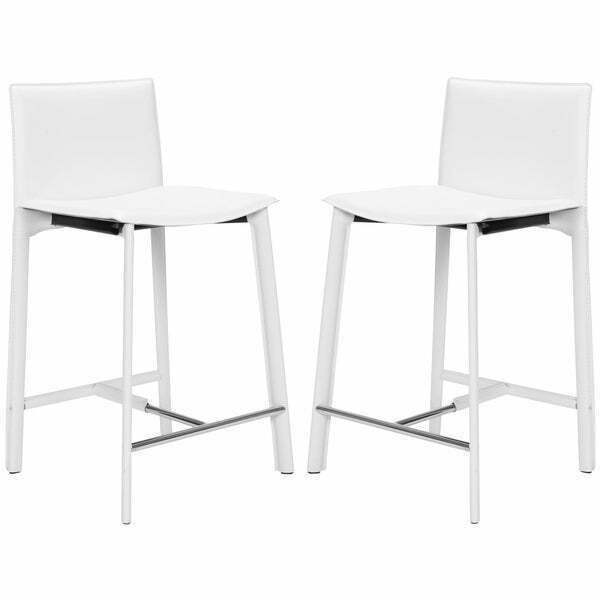 Each set comes with two stools, each upholstered in striking white leather. Combining modern coloring with a classic shape, these stools blend in naturally with any decor. Avoid placing your furniture in direct sunlight and maintain at least two feet between furniture and heat sources. Aniline and protected leathers are especially sensitive to direct sunlight. Use a professional cleaner to help resist staining and prevent overall soiling. For oil-based stains, use a professional degreaser. Dimensions 34.2 in. H. x 17.8 in. W. x 19.8 in D.
I thought I was taking a chance by ordering 2 sets of stools, boy was I wrong. If I had a magic wand I could not have done better. The leather is strong and smooth. The color is a just right white, not shiny or dull. Easy to assemble and EVERY thing needed is supplied. The seat and foot rest height are perfect. Easy to sit on (not too high). I paired these stools with a glass top table with a stainless crossbar stand which allows the whole stool to be seen from any angle..fabulous eye candy. They are modern, classy and sophisticated. I can't stop looking at them. LOVE, LOVE, LOVE them! Received these stools and there was a part that was broken. Contacted Overstock and they sent a new chair out right away. They are true to the description. The stools arrived in a few pieces, so assembly seemed like it'd be simple. However, one of the four stools was missing necessary holes (fortunately just in the fabric part so my husband used scissors to create it). Additionally, we essentially had to bend the legs a bit to get them in the proper location. This required two people. Ultimately, the end product was totally fine (height, etc.). We put them at our kitchen island and have received tons of compliments. I was so anxious to receive these stools. They came packaged with great care and were very easy to assemble. However, they were too short. I wanted to use them around my kitchen island. The seat height was suitable, but the back of the chair was far too short. I found the chair to have a trendy look and have a comfortable feel, but because the chair back was too short, they just looked goofy around my island. As always, Overstock.com took care of my concern with professionalism and I was able to return them without any issue. Love the bar stools! They fit great next to my marble kitchen counter. I highly recommend these counter-height chairs. They are surprisingly comfortable and look so modern. The leather is easy to keep clean and the chairs were very easy to put together. I did have a small problem with a defect part, but O.co rushed the replacement out and all is fine. Not a good product at all. The leather is way cheap with yellowish color. It's not white. Pleased with how sturdy the stools are. Shipped very quickly. I loved these stools but unfortunately they were too short for my counter and I had to return them. They appeared very well made and stylish - wish they would have fit! After a year of using these in our kitchen the seams along the back began to separate. There is insufficient padding in the feet that leads to floor scratches. These have a permanent place in our basement storage room. We only break them out for large parties when we're desperately in need of extra seating. Not worth it. I wanted to love these.... a bit too...... i dunno..... blah... The height was just slightly off for my tops and so I had to return. Overall good quality. The chairs were a little challenging to put together as some of the holes didn’t line up. I’ve seen similar chairs for quite a bit more so overall I’m happy with my purchase. They have a short seat, black metal underneath and they are not true white, more like a bone color. They are Ok for the price but may not be for everyone. Good quality, good color, easy to put together. one of the 4 I ordered won't go together properly because of manufacturer problem with the holes in the chair, where the cross bars attach. They look good for the price. "Do you have these in black? Need to match my other two"
Unfortunately, we currently do not offer these in black. "Are these a true white or off white/ivory?" Hello MrsB178, these stools appear to be a true white in my opinion. We try to represent the colors of our products accurately. Unfortunately, due to the difference in monitor colors we cannot guarantee that the color will match exactly what you see on your screen. Thank you for shopping with us. "I really need 5 stools, is there any possible way I can buy one individually?" Hello Michelle, these are only sold in sets of two. Thanks for shopping with us! "What is the actual seat height? The descriptions says 24", 24.5" and 25.5". Pick one?" Hello errapi, the seat height is approximately 24.5 inches high. Thanks for shopping with us! "It looks like the legs are wrapped in a leather cover. Is the WHOLE base and legs made of the same stainless material? If so, I am contemplating removing the leg covers." Hello summerjess888, we appreciate your inquiry. The legs are wrapped with bonded leather, so only the step part is chrome. The rest is made from steel that is not chrome plated, so we do not recommend removing the leg coverings. We hope this information has been helpful. Thank you for shopping with us. Have a great day! "How much does each weigh? What is the footprint of the stool feet? Thanks." Hello micherine, According to our information the chairs weigh approximately 9 to 10 lbs. each and the feet are little round metal discs. Please let us know if you have additional questions and thank you for shopping with us. Safavieh Mid-Century 26-inch Garretson Taupe Counter Stool (Set of 2) - 22.6" x 17.4" x 36.2"
Safavieh 26-inch Garretson Buttercream Counter Stool (Set of 2) - 22.6" x 17.4" x 36.2"